It seems obvious at first – why shouldn’t we have record sales each year as the market grows? Orlando tourism thrives, the entertainment industry is expanding, and the real estate market is a solid investment in the sunshine state. Yet, there’s another aspect to the equation; the vacation rental industry is multiplying too as more and more companies start up and want a piece of the pie. So, while there’s more business, competition too, grows increasingly tougher. So what is our secret to success? Luckily for us, most companies don’t share our devotion or high standards. Vacation management is far from standardized and the competence varies greatly. 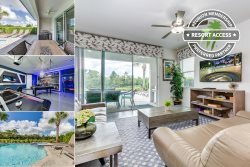 Reunion Vacation Homes is fortunate to employ reliable and experienced professionals who share the company vision to always seek the highest measure in all that they do. From marketing to guest experience, each team handles every angle possible to gain and retain good business. One of RVH’s strongest assets is a reservations team that handles all direct bookings. Giving first-hand advice over the phone or chat they are able to guide each guest to find their match among a wide selection of vacation rentals. They know each property, and they are well familiar with each resort and its amenities. As locals of the greater Orlando area, they are also able to answer questions beyond that which pertain to hospitality. Guests can put a trust in a complete familiarization otherwise lacking from third party bookings. It is with great pride that we congratulate our reservations team for record sales kicking off the New Year of 2018. The reservations team is in turn privileged to have the backing of an award-winning marketing team with all the skills and knowledge needed to approach the discipline from every angle. It is a rare advantage to have a fully equipped in-house marketing team handling everything from web development to video/photography production, copywriting and graphic design. Without the need to outsource parts of the workflow, the sales and marketing teams are able to collaborate and quickly tackle specific needs within shifting booking trends. Sales & Reservations work in sync with marketing & web applications for a steady annual growth. While new business is gained via sales & marketing, one of the most important aspects of our success is repeat business earned via guest satisfaction. While some management companies focus only on sales they will never build the good reputation a brand is reliant upon. We cannot omit the importance our operations team and guest relations play in our growing business. It is with great confidence that we plan to continue our success for years to come, knowing we have a solid backing from the fantastic individuals who make up the team we like to call Reunion Vacation Homes. Third-party sites have terms that favor the guest, such as cancellation policies favored into ranking algorithms. We want to be guest friendly too and encourage bookings, but at the same time, we have an obligation to the homeowner.